Obituary – Lee Jr., Glen Herbert « Perry High School Alumni Association, Inc. Band 49-50, Basketball 49-52, Football 50-52. Glen Lee Jr., 46, 1316 Jackson street, died at 8:10 a.m. Monday at Perry Memorial hospital where he was admitted Sunday morning for treatment of ill­ness. Funeral will be at 2 p.m. Tuesday at Parker Funeral chapel. Rev. Charles R. Ledin, pastor of the Zion Lutheran church, will officiate. Burial will be at Grace Hill cemetery. Lee was born in Perry, Oct. 1, 1934, the son of Glen and Goldie Fay (Eikenberry) Lee. 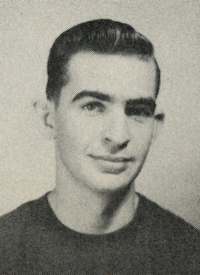 He was a 1953 graduate of Perry high school and attended Oklahoma State university. He had man­aged a DX service station in Perry and was a former man­ager of the Montgomery Ward catalog store here. He most recently had been employed by the Big Chief Drilling company of Kingfisher. Lee served two years in the United States Army and was a member of the Zion Lutheran church. Survivors include one daugh­ter, Dana Lynn Lee, 728 Wick­low, Stillwater, recently of Perry; his parents, Mr. and Mrs. Glen Lee Sr., of the home ad­dress; and two sisters, Mrs. Harold (Juanita) Noonan, Thomas, Okla.; and Mrs. Jack (Jean) Holland, Sand Springs.